Most people don’t know this, but as one Washington Jewish Film Festival ends, preparation for the next is already happening with films in production being “tracked,” filmmakers submitting new work and lots of thinking about a place for some of the many good films we just couldn’t find room for in the Festival wrapping up. And now, unbelievably, last year’s “next” is almost “now”! After watching someplace around 300 features, documentaries and shorts plus scouring the Jerusalem and Berlin film festivals – I know, tough job – the program is set, catalog out there in public, new website up and running AND tickets selling. It’s so exciting to see that after just three days, over 800 tickets have already been sold! In fact, Festival coordinator Josh Gardner commented today that checking the ticket sales numbers is like a new drug! He’s right. Watching the numbers, seeing what the favorites are during one of our many checks, guessing which film will sell out first…Okay, no betting money has changed hands yet, but we each have our favorites! I do have to say that it’s so encouraging to know that the program is being received well. This year we are showing more films than ever before – 62 films from 20 countries including perennial favorite sources Israel, France, Germany, Argentina, the US, Switzerland, Canada…as well as some more unusual film sources such as Tunisia, Slovakia, Russia, Ireland, Denmark and Kazakhstan. Check out our opening night film, A Matter of Size, Israel’s award-winning romantic comedy about four very overweight guys ditching their diets in favor of becoming of sumo wrestling stars. Just click below to see the film’s trailer. But keep in mind that this film on December 3 with a matinee on the 4th and the closing night film on December 13, The Gift to Stalin, are both selling very well. So take a look and then get busy and buy your tickets sooner than later by going to WJFF.ORG. Lots of info about the schedule, venues, all the films, guests, special receptions and parties plus links to buy tickets. You can even sign up online to VOLUNTEER for the Festival. Great fun, and that’s how I got started with the WJFF way back in 1994, but that’s another story…. Silverdocs always has a bunch of good Jewish-themed films and this year is no exception. One of the films we’re excited to see is Four Seasons Lodge, about a group of Holocaust survivors who meet annually at the Catskills bungalow colony that gives the documentary its name. It is screening this Sunday at 5:30 pm– the Tuesday night screening apparently sold-out, so if you want to go, we suggest pre-ordering or showing up early for the stand-by line. The film simultaneously documents two sadly dissapearing phenomena: 1) Living Holocaust survivors capable of telling their own stories and bearing witness both to the horrors they lived through, but also the lives they managed to rebuild; and 2) the tradition of the Catskills, once the preeminent leisure destination for a generation of newly propserous (and often newly American) Jews. It is a film that is definitely worth your while. 7:30 pm–The Screening Room presents: About The Body. When a terrorist attack occurs, the dead are mourned, the calls for vengeance are issued and eventually, the news cycle churns on. But what of those whose lives, whose physical bodies have been forever changed by the trauma? How does a young woman regain a sense of comfort and joy in her damaged body? This extraordinary documentary follows 12 such young women, recovering from injuries sustained in attacks, participating in a movement workshop run by Israeli Prize winning dancer Ohad Naharin. Following the screening will be a discussion with Steve Shafarman, creator of FlexAware™ for movement and healing. 7:30 pm–Nextbook presents: Amy Bloom. The National Book Award finalist (for her premiere book of stories, Come To Me) and psychoanalyst reads from her most recent novel Away. The final Nextbook event of the season. 7:30 pm–Introduction to Judaism. One of our most popular classes begins a new 6-week session covering the basics of Jewish ethics, philosophy and observances. If Wednesdays don’t work for you consider the Thursday night session beginning June 5. 6:00 pm–Step-N-Sculpt with Lynda. Memorial Day is around the corner. The beach beckons. Are you ready? 7:30 pm–The Chaim Kempner Author Series Presents: Jewish Major Leaguers. Who have they been? What have they accomplished? And why do we care so much? Featuring: Mark Lerner, Principal Owner of the Washington Nationals, Stan Kasten, President of the Washington Nationals, Dr. Martin Abramowitz, President of Jewish Major Leaguers, Inc., and Aviva Kempner, director of the award-winning documentary The Life and Times of Hank Greenberg. The Screening Room Presents: A Hebrew Lesson with director David Ofek–Meet the director of the acclaimed Israeli documentary No. 17. While that film examined Israeli society through the prism of a terrorist attack and one of its unidentified victims, his latest film tackles a similar topic through the experiences of those trying to adjust to Israeli society in an ulpan–an intensive Hebrew-language school. The Price by Arthur Miller – Final Performances Before Passover. The holiday means this is your last chance to catch the Prosky family in Theater J’s acclaimed production. In addition to evening performances Tuesday, Wednesday and Thursday; there are matinees both Wednesday and Sunday at noon. Nextbook Presents: Jody Rosen at Busboys & Poets–Rosen is the curator of the new CD Jewface, a remarkable collection of popular “ethnic” songs from the 1905-1922. The songs were often gross caricatures of Jewish stereotypes: big nosed, greedy businessmen, nebishy immigrants or romantic weaklings. There’s a catch though, the songs were mostly written, produced and performed by Jews for a largely Jewish audience. 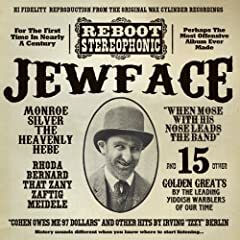 Among them were some of the Jewish legends of Tin Pan Alley including Irving Berlin, Eddie Cantor and Fanny Brice (one can even hear the opening bars of Berlin’s God Bless America in the cringe-inducingly titled When Mose With His Nose Leads the Band). These songs, recovered off of 78rpm discs and wax cylinders, are of course first-cousins to other “race” songs of the period, most notoriously, minstrel songs. Rosen, the author of White Christmas: The Story of an American Song unpacks the cultural history of the songs and interprets their modern significance. Annual Second Night Community Seder–Come celebrate the second night of Passover with new and old friends at the Washington DCJCC. Our welcoming seder will be lead again by Cantor Maurice Singer and is open (with pre-registration) to anyone who wishes to attend. Next year in Jerusalem, but this year at 16th and Q.
Monday, March 3–The Screening Room Presents: The Champagne Spy. An amazing but true story of a Mossad agent who never really ever came in from the cold. On assignment in Cairo posing as an ex-Nazi billionaire, Wolfgang Lotz became so enmeshed in his new identity that he never returned to his family again–even to the point of marrying a woman he met in Cairo. Told through the eyes of his son Oded, Lotz’s legacy is viewed from the perspective of the family he left behind. Tuesday, March 4—Shalom Hanoch in concert at the Lisner Auditorium. One of the biggest legends in Israeli rock comes to DC. Tuesday, March 4–A new session of Hebrew Classes begins. With five levels to choose from, there’s never been a better time to start learning from aleph or brush up on your ivrit. Tuesday, March 4—Learn how to play Mah Jongg in a four week class that will take you from rookie to maven in no time. This isn’t your bubbe’s Mah Jongg! Wednesday, March 5—Speak Out! A Public Speaking Workshop with Sarah Gershman. Want to improve your presentation skills for work and life? This workshop will help you overcome anxiety and develop stage presence. Thursday, March 6—Jews in Jazz with Larry Appelbaum. From Benny Goodman and Artie Shaw to John Zorn and Anat Cohen, Jews have not only been a presence in this most uniquely American music form, but they have brought a Jewish influence to the form. Library of Congress Senior Studio Engineer and jazz specialist Larry Appelbaum returns to the 16th Street J with this four week class that covers the history of Jews in Jazz from the 1920s right up to the current wave of Israeli jazz musicians. This class has been cancelled. Saturday, March 8–Theater J’s $25 Preview of The Price by Arthur Miller, starring Robert Prosky, John Prosky and Andrew Prosky. This scorching, three-time Tony Award nominee for drama features beloved DC treasure, Robert Prosky, alongside his two sons for the very first time on a DC stage. A pay-what-you-can preview is also available on Sunday, March 9 at the 7:30 pm performance only and again on Tuesday, March 11. The show runs through April 18.